Can activated carbon remove formaldehyde? In a previous blog post, I wrote about how my tests showing that carbon can reduce VOCs from cigarette smoke. I also wrote about who actually needs activated carbon to reduce VOCs (hint: not everyone). But here I test whether carbon can filter out formaldehyde. Formaldehyde is a big deal in China. I’ve found most of my Chinese friends know the word “formaldehyde.” But this is not because Chinese people are all science nerds. At dinner with Chinese colleagues, my friend David once used the word “carbohydrate” (碳水化合物) and was instantly made fun of for using a “science word” in casual conversation. Why the double standard? Because in China, just like carbs in America, formaldehyde is an everyday health concern. Why are they so concerned? Formaldehyde is a volatile organic compound (VOC) that causes scary health problems like ulcers and cancer, yet it’s common in construction materials and new furniture. The people who should worry the most are people in new or recently renovated homes. Tests of new and renovated homes routinely find high levels of formaldehyde. 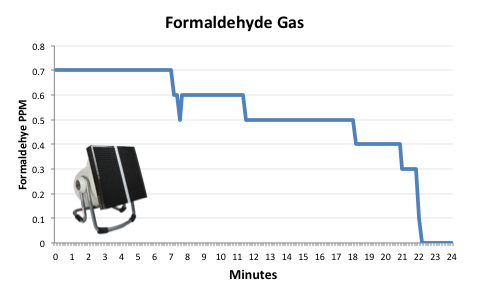 Formaldehyde is a tricky problem because – just like all VOCs – it escapes from materials as a gas, and HEPA filters aren’t made to capture gases. I’ve heard companies claim that activated carbon can remove formaldehyde, but I’ve also seen companies selling sprays that claim to clear formaldehyde from your home. That sounds a lot like snake oil to me. In my quest for an answer, the first stumbling block was detecting formaldehyde. 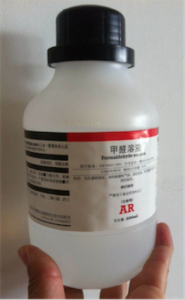 Many companies on Taobao will sell you a “formaldehyde detector”, but they’re actually general VOC detectors. 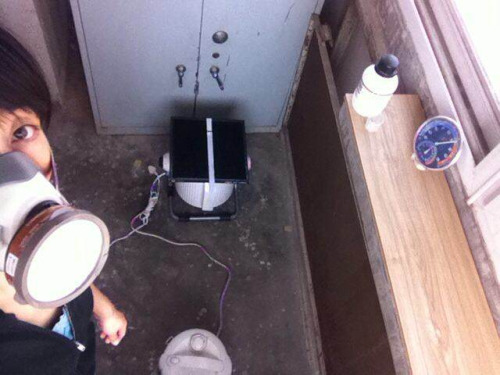 (There are lots of volatile organic compounds; formaldehyde is one type.) So even if the machine tells you it’s detecting formaldehyde, you have no way of knowing whether it’s formaldehyde or some other VOC. These “formaldehyde” detectors even react to oranges. Thus, to be absolutely sure we were detecting formaldehyde, my collaborator Anna bought bottles of liquid formaldehyde–risking our health for science! These composite activated carbon filters removed formaldehyde from the air. My earlier tests show that these carbon filters remove other of VOCs too. As always, I’m including the raw data and more details on the testing for fellow nerds. 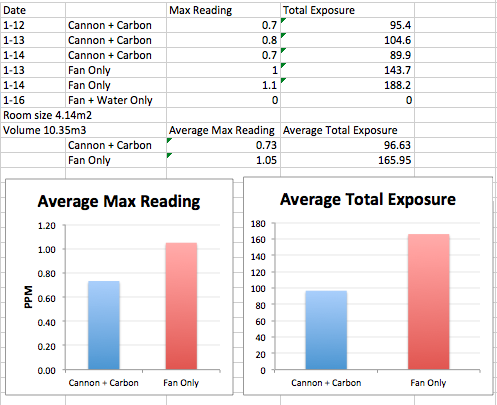 Check out my earlier VOC and carbon tests for more details on the MX6 detector, placement of the detector, and the fan-only control condition. Conditions were identical except for the pollution source. However, one difficulty of that sort of test is that the VOC detector wouldn’t be able to tell us if we’re detecting formaldehyde or other VOCs – hence we wouldn’t be able to detect whether the carbon is actually removing formaldehyde or other VOCs. In one sense, that’s not important–we want to get rid of all VOCs. But it would also be interesting to know if we’re getting formaldehyde specifically. To do that, we would need to take gas samples and have them sent to a lab (although if anyone knows of an easier way to detect formaldehyde and only formaldehyde, let me know). What is your suggestion for a filter system to put in our new manufactured home that warns of formaldehyde? 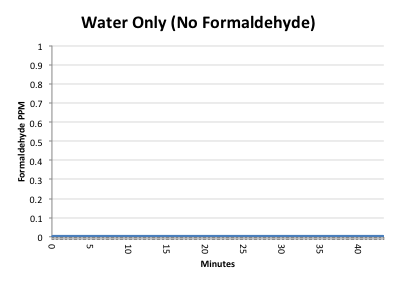 Measuring formaldehyde is not easy. 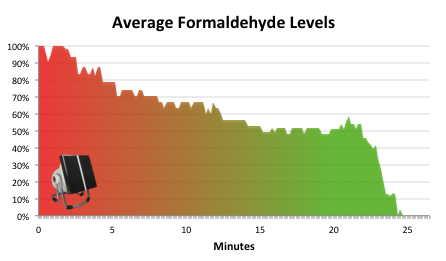 See this article we wrote on how you can detect formaldehyde in your home. Short answer: your nose does a very good job of detecting it, and may well be more reliable than other devices out there. Love your site and the work you’ve done. 1. 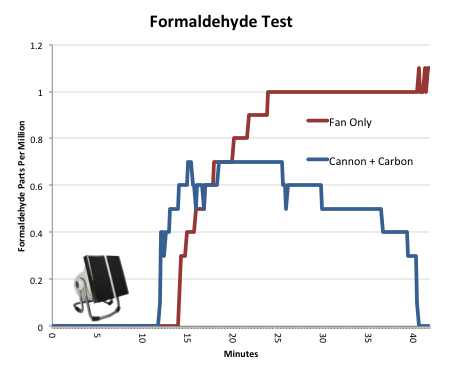 Carbon is inefficient at removing formaldehyde compared to other VOCs. 3. 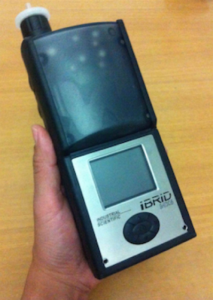 The PID meter you are using is rather low resolution at 100ppb. You would be much better off with a meter with 1ppb resolution. See the ppbRAE3000. That’s what I use in testing. Does the activated carbon filter get attached first or after the hepa filter? Your site is hard to navigate and find the information about the products and how to use them. I’ve been using the Cannon for 4 years w/ the hepa filters. Just got some charcoal ones to add… wish it was easier to find things .. Thanks! Hey Noah, Paddy here in Beijing. You’re right it’s pretty hard to navigate the website, we’re working on trying to streamline everything, but these things take a while. 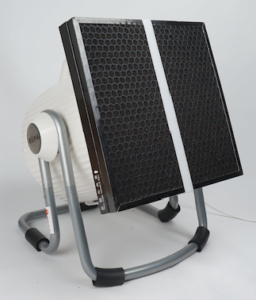 To answer your question: we generally suggest putting the carbon filter on the outside, as that ensures a better seal between the fan and the HEPA filter (the pre-filter acts as a good seal!). Here’s an image explaining it, but I’ve also added it to the cannon page. Thanks for your suggestion!